Frank Milner arrived at Allensworth from the Bay Area in 1911 and set up his first barbershop in a small frame house. Milner’s barbershop played an important part in the early Allensworth community. The men of the town met at Milner’s to argue over "all manner of agreements and disagreements." (Armilda Archer Smith noted that "Women didn’t go in barbershops in those days.") The community orchestra, organized by Joshua Singleton, practiced in the shop. Mr. Milner and helpers mixed sand and cement together, poured the mix into a press, and soon a rectangular block would be formed. As these became dry and firm enough to hold together, they were put into place to form the walls of the building. A large picture window was installed in the front wall, and a stationary barber’s pole was cemented into a hole just outside the front door and painted with the customary red and blue stripes. In the early 1920s, as Allensworth’s economic problems grew, some of the settlers moved on. By 1924, Frank Milner had established his barbershop in Tulare. He was in business there for many years, and among his customers were men who had once been his neighbors in Allensworth. The concrete blocks used to build Milner's barbershop were created using a Wizard Automatic concrete block machine, seen below. A "standard plain face" face plate was inserted into the machine to obtain the desired look. The last two images are of the only remaining concrete block from Frank Milner's barbershop. 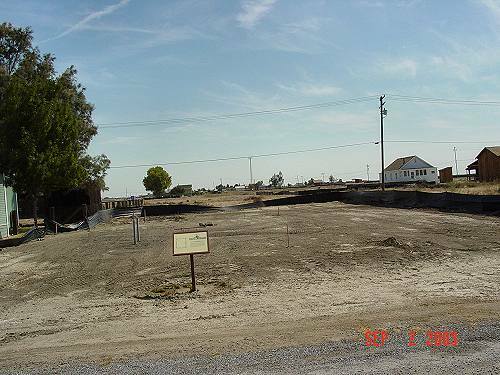 The current building program at Colonel Allensworth SHP includes the reconstruction of Milner's barbershop. The structure was important both for the town’s history and as an example of its architectural diversity. The barbershop was the only concrete block structure in Allensworth. Over time, it had been completely dismantled, with only the concrete foundation walls remaining. This picture was taken in September 2003 at the Milner's barbershop reconstruction site. Excavation work has been completed. Archaeological testing was conducted to expose the foundation, as well as two interior walls and the remains of a storage cellar. 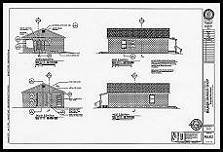 Shallow units, one at the southeast corner and one at the southwest, showed the depth of the foundation. Two deeper units in the northeast quadrant established the location of the cellar. Trenches, one east-west and one north-south, revealed the interior walls. Click on the thumbnail below to view the full-size image.